In the penultimate matchup of Round One of the Hornets247 Tenth Pick Tournament, centers Tyler Zeller and Meyers Leonard are pitted against one another, with Mason Ginsberg and Jason Calmes making the arguments. To start off this “debate”, I thought I’d bring a bit of relevant news to the table. Last week, Tyler Zeller worked out in Portland for the Trail Blazers with none other than his opponent in this tenth pick tournament, Meyers Leonard. According to ESPN NBA Draft Analyst Chad Ford, was that Zeller was “very crafty and skilled, allowing him to “get the better of Leonard.” One workout certainly doesn’t tell the whole story, but it’s a nice place to start in order to compare the two 7-foot centers. Now, more about Tyler. If you like the Jason Smith that we saw this past season, then you are absolutely going to love Mr. Zeller, as he is basically an immensely more talented version of Smith. The two are almost identical in size; both are 7 feet tall, and Zeller is about 10 pounds heavier than Smith at 250 lbs. Both have incredible work ethic and the burning desire to continue to add elements to their game; we saw that from Smith via his improvement this past season, and Zeller has done it throughout his entire collegiate career at UNC. Both players also have a pretty jump shot to complement their size, as scouts project Zeller’s range to eventually reach out to 18 feet. After those similarities, Zeller begins to really surpass Smith. While Jason has shown his ability to run the floor, Zeller takes it to a whole new level, converting on a very impressive 79% of his field goal attempts in transition during his senior season at UNC (courtesy of DraftExpress.com). He would instantly be one of the fastest big men in the NBA and an asset on fast breaks, which would be huge for a defensive-minded Hornets team that would look to thrive off of generating turnovers. For this reason, Zeller would be an ideal pairing with Anthony Davis in the Hornets’ front court; I could see Zeller getting 2 or 3 dunks per game simply as a result of Anthony Davis blocks followed by Zeller torching his man down the floor. But I digress. I am here to argue for Zeller over Leonard, not Jason Smith. To really see just how talented Zeller is, take a look at this. Out of all 2011-12 NCAA forwards and centers who played at least 20 minutes per game in 25 games or more, only 8 players had a PER over 29.5 and a true shooting percentage over 60%; Tyler Zeller was one of them. Of those eight, only four other than Tyler came from schools in major conferences, and two are projected top-3 draft picks – Anthony Davis this year, and Cody Zeller next year. To say that he performed at an elite level for UNC this season is an understatement; Tyler Zeller was dominant. The case against Leonard is an easy one to make – he is far too risky of a draft choice, especially as high as 10th overall (for what it’s worth, most mock drafts have him being selected somewhere around 20th). The raw ability may be there, but there are far too many question marks about his game and motor to warrant a top-10 choice. After landing the top pick which will no doubt turn into Anthony Davis, the Hornets have the luxury of not needing to gamble on a guy to turn into a star who could just as easily never put it together. In the case of Leonard, the latter appears more likely than the former – he lacks confidence, assertiveness, and mental toughness, not to mention his expected inability to muscle up against many of the NBA’s best scoring big men due to very limited strength and bulk. Even if he were to completely maximize his potential, the only reason to argue that he could potentially experience a better NBA career than Zeller would be his wingspan edge. Both players are equally tall at 7 feet (the two tallest players at the NBA draft combine, as a matter of fact), but Zeller’s skills are more polished in every way – a more advanced post game, superior free throw shooting (81% vs. 73%), much better rebounding numbers (13.6 per 40 min vs. 10.3 per 40 min), and deeper jump shooting range (18 ft. vs. 12 ft.). When choosing between Zeller or Leonard, it all comes down to this – why gamble on a project when you have a proven commodity right there for the taking? With Zeller’s current resumé, it is inescapably clear that he and Anthony Davis would mesh together perfectly, and could create the beginnings of the league’s strongest front court duo for the foreseeable future. With the addition of Anthony Davis, the Hornets strength has essentially shifted from the backcourt to the frontcourt. If we are going all-in down low, then we need to invest in some height, as our only 7’ player has been much worse at center than at power forward. 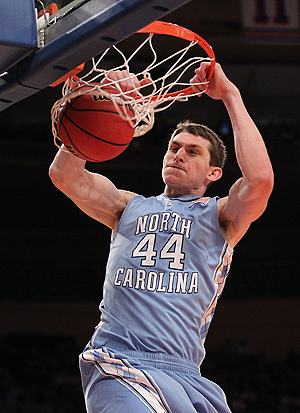 This brings us to the two most highly rated 7’ players in the draft: UNC’s Tyler Zeller and Illinois’ Meyers Leonard. At 7’1.25” in shoes, Meyers Leonard is the tallest player at the combine this year, 0.75” taller than Tyler Zeller. Leonard is also taller without shoes, has a 7’3” wingspan and 9’0.5” standing reach compared to 7’0” and 8’8” for Zeller. Both are around 250 lbs. Let’s lay down a Centerometer to see exactly what this means. Dwight Howard is class of centers these days, and Emeka Okafor is our center who is constantly being described as undersized. “Undersized” Emeka is 6’10” 255 lbs, with a 7’4” wingspan and 9’3.5” standing reach, while Dwight is 6’11” 265 lbs, with a 7’4.5” wingspan and 9’3.5” standing reach. So if that is the difference between size that is never mentioned, even to say, “His talent overcomes his size,” then 20 year-old Leonard whips the 22 year-old Zeller black and Carolina blue even without growing another iota. Additionally, being the tallest player at the combine, and only at least 7’ tall first round projection that will be under 22 on draft night with over 9’ standing reach. This makes him rare with respect to measurables, and with potential to be even rarer given his age. Measurables are not everything, but they are not nothing. I want to bring Hornets fans back to February 26, 2010. On that night, a mostly-quiet-until-then 7’0” Aaron Gray held Dwight Howard to 2 points on 1 of 3 shooting in the fourth quarter after scoring 24 in the first three. He was not having an off night until facing The Grayt One. Quite the contrary, in fact, and Gray shut him down. This is what a center who can present a wall of unfamiliar and uncomfortable size. Remember Gray + Lakers + playoffs? This is what Leonard can do much more effectively and do it to many more players than Zeller. Per 40 minues, pace adjusted (used throughout for counts), Meyers recorded 17.2 points with a true shooting percentage of 62%, 10.4 rebounds, 0.6 steals, and 2.4 blocks. Tyler netted 21.1 points true shooting percentage of 62%, 12.4 rebounds, 1.2 steals, and 2.0 blocks. Overall, Zeller’s numbers are impressive and more impressive than Leonard’s slightly less impressive numbers. Let’s consider three other numbers, though. The first is 5. This is Kendall Marshall’s number. Zeller’s number benefit from one of the brightest and most selfless players in recent NCAA history setting him up. The other two, we mentioned before, 20 and 22. Leonard is only 20 and has played on 2 years of college basketball, whereas Zeller has been at UNC for four years. Looking at Zeller’s second year, he produced 17.4 points with a true shooting percentage of 56%, 9.8 rebounds, 1.1 steals, and 1.9 blocks, a line that is an effective push with Leonard’s second year. If Zeller showed that much improvement in 2 years, so can the larger Leonard. It’s easy to just declare these things, but I bring you something more than an empty declaration. I bring data. Leonard played this past Summer for the U-19 Team USA at the FIBA World Championships in Latvia. This experience seems to have catalyzed his off-the-court professionalism and had a positive effect on his confidence and maturity. He’s shown marked-to-staggering improvement over his first-year stats at Illinois, and reviews of his play have improved even more. This is the kind of response to a challenge Monty wants in players. He’s not said it, but I think he wants a player who, when confronted with a wall, will slam his face into it over and over and over, if that’s what it takes, until the wall is down or the guy is dead and disfigured. Not being the best player around is far from the most adversity Meyers has faced. The product of two athletes who have met with tragedies. Meyers was then somewhat raised by the family of a friend while his mother was homebound. Meyers not only overcame these obstacles, but also the value of accepting help. This is humility and coachability. Pair with this the discussion of Leonard’s “ideal size” and “athleticism” against the low ceiling of Zeller, and the Zeller’s appeal doesn’t stack up to Leonard’s. All of this and the likelihood that the Hornets will never be able to get this much size and potential for ~$10m over 4y while Anthony Davis is on the roster leads me the following conclusion: It’s now or never. I like Leonard a bit more than most here, but Zeller definitely wins this one for me. I’m not sure anyone will agree with your proposal, Ron. Bad idea. I sure am glad neither Mason nor myself advocated or intimated this in the slightest, only making arguments considering just these two players assigned to us to the exclusion of other possible draft choices and roster moves, as you know from reading the posts in this series. ETA: or are you suggesting that at least one of these centers, if drafted, by us, could lead to our front court being on the all-rookie team? Not sure about the PT, if so. Hard to choose but I gotta pick Zelller. 10 is way to high to be pickin Leonard and Zeller is more skilled. I really wonder where Leonard would be picked if he had the same exact game but was European, as opposed to American born. I mean, look at how raw Jan Vesely was coming into last year’s draft. Different positions, but Veseley was a raw physical freak with “upside” and went high. Beyond that, were Kanter and/or Jonas V. really that much better prospects last year? What had they done, production-wise? Jason’s arguemment really makes me wonder what Leonard’s numbers would have looked like with the best pure PG of the last five years- Kendall Marshall. The difference between Leonard and Euro guys ? They are used to play against bigger competition, they are pro before they turn 18 so they play for at least one year against grown men and they’re go-to-guy in their youth national team (oh, and they play for their senior national team). If Leonard was European, he would be a 2nd round in the best case. FIBA does not equal NBA, not even close. Playing in Europe does allow for early maturation, that’s a great point, but Leonard could still be good/great with some good mentors and coaches around him teaching him the NBA game. I’ve stated my opinion on Leonard before. I’ll just copy that. “You are spot on for Leonard. I live in Big 10 country and I feel bad for whoever selects him. I watch a lot of college basketball and obviously a lot of Big 10 action. There was never one time where I watched Illinois and was really impressed with Leonard. He would often disappear, be bullied in the post, or on the occasion where he was having a nice stretch, he would get tired. If he was having to play a physical style of game, when it was time for a time-out the guy was clearly gassed, even after just a few minutes. Coach Weber would even call timeouts at times during a stretch because Leonard was gassed and could barely get down the court. I just can’t rally behind the guy. I think Zeller in this case has the 4 years of college. If he could be allowed to play 5 years of college, it’d be huge. The guy just needed one more year to grow. However, I think he can be a solid guy. Not an all-star, but solid. And if he worked out, how scary would Davis and Zeller be? This one is Zeller for me. Mostly because Leonard is arguably my least favorite of the first round prospects. Spoken like a true Indiana fan. You do realize that it had more to do with Weber’s system (he got fired because of it) than Leonard himself right? Weber had him drifting all over the court, above the free throw line, multiple ball screens etc etc. And if you watched so many of our games, you also know that we had no true point guard to feed the post right? He is raw thanks to Weber, but with proper coaching at the NBA level he will flourish. I’ll take potential over the safe pick. I’m choosing Leonard over Zeller. You just don’t see a bunch of 7+ footers that have a solid body and move as well as Meyers. Look at Leonard and look at Zeller… Zeller has had the best coaching for four years in a top program. Leonard has improved exponentially in a rather weak basketball program. Zeller is at his peak. Leonard is not even close. Now think, when you get a rookie the last thing you are going to do is throw him into the mix right away. They aren’t ready to compete at the NBA level. So, do you choose Zeller that is at his peak and by the time he starts playing is just going to be 3 years older? Or Leonard that has yet to get solid coaching, has freakish athletic ability and could be one of the best players in this draft class? If I were to choose, no question it would be Leonard. He blew away coaches and scouts at the combine and is a very hard worker. The kid has been threw a lot. He’s gonna stop at nothing to get better. I like Zeller a little more than most of the draft evaluators I read. He’s solid in many aspects of the game. He has a nice stroke out to 15′, passes well, runs very well, blocks shots, can score on the block, has a high basketball IQ and is a legit 7′ 250pds. Not worried about his age or his ceiling. He may not be an elite athlete, but he’s a good one and in my mind would compliment Davis very, very well. We should be looking to put together a team that meshes not a collection of the best athletes. A similar analysis could apply to Kendal Marshall. Not the most dynamic guy, but would fit well with Davis and run the team for the next decade making everyone, especially a guy like Gordon, a better player. I’d be happy if we came out of this draft with some Carolina Blue on the roster.